On a cool, breezy summer evening, music emanates from the middle of the block on 18th Street, steps away from Dolores Park. The lovely voice of a woman summons, rather easily, others to a delightful space. Stepping inside, there are vibrant and colorful drawings of sweet breads and cakes adorning the walls. The music that lured people in is just as intoxicating as the wine and food served. A songstress taps at an upside-down metal bucket fashioned into a stringed instrument while singing with perfect key and timing. Looking around, the tables are filled with people and food. One of the chefs for the event walks over with sushi wrapped in nori with intricate laser-cut patterning. Sitting down on one of the benches and with possibly the freshest ceviche ever made, it was hard not to feel captivated by the warmth and uniqueness of the space—not your average closing art exhibition. Yet, this is the constant environment and ambiance found at nonprofit organization 18 Reasons. In 2007, Bi-Rite Market took over the space formerly known as Blue Space from founders Cliff Leonardi and Dan DiPasquo. Paying homage to the iconic San Francisco 17 Reasons sign that served as a part of the Mission District skyscape, Bi-Rite decided to rename the event and gallery space to 18 Reasons after its new home on 18th Street. 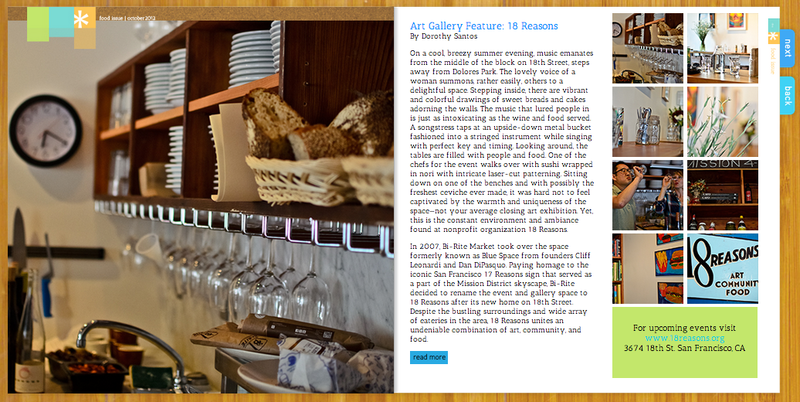 Despite the bustling surroundings and wide array of eateries in the area, 18 Reasons unites an undeniable combination of art, community, and food. With the objective of creating community through food and art, the programming literally and figuratively caters to the diverse San Francisco community. In early October, I wrote a Shotgun Review for Art Practical on the opening of the Ever After exhibition at the Chapel of the Chimes in Oakland. Over the weekend, I attended the closing exhibition, which included some wonderful performance pieces. Admittedly, I’m not the biggest fan of performance art but when it’s done well, it’s quite the experience. Below, I’ve posted a few photos of my favorite pieces at the closing. Reflection to follow. Please click on the images below to learn more about the artists.